Odds are that if you know about Johnny Weissmuller at all, you know him as an actor who played Tarzan. Maybe you even know about his pockets full of Olympic gold and record-setting competitive swimming career. If you read my last review, you also know he faced a giant spider in Tarzan’s Desert Mystery . Well, my friends, today you’ll learn about his second encounter with a big damn spider, as Jungle Jim in Fury of the Congo . Jungle Jim was created by Don Moore and legendary artist Alex Raymond to compete with jungle comics featuring characters like Tarzan and Ka-Zar. The property distinguished itself by having the lead be a big hunter, along the lines of Allan Quatermain, and by being set in Asian jungles rather than African. It did well enough to get a radio show and a movie serial, but it was the 1948 release of Jungle Jim starring Weissmuller that finally made the character stick outside of comics. Weissmuller had made 12 Tarzan films — the last one released the very same year as Jungle Jim — and he would go on to play Jim in 13 movies and a TV show. 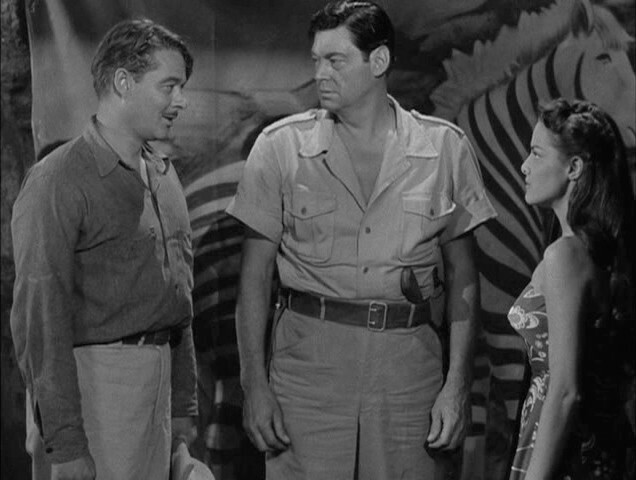 Three more movies feature the actor as himself in the Jim outfit, settings, and situations, because the show had taken the rights to be use Jungle Jim. Hollywood gets weird like that. 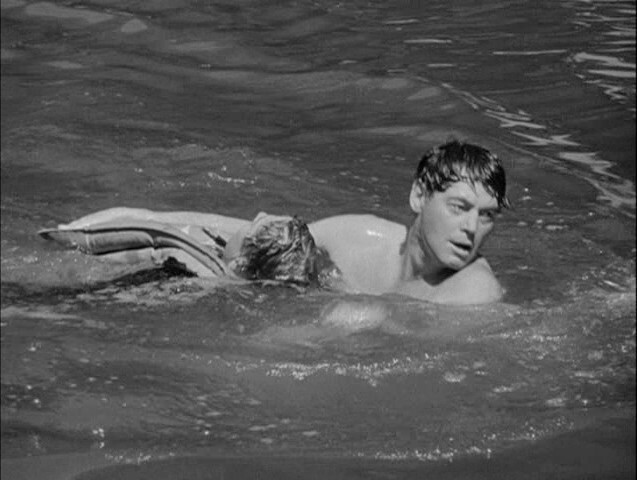 Jim saves Cameron, whose plane went down in a lake. There’s a tendency to view the Jungle Jim movies as “Tarzan with pants”, and there’s a decent case for that. For one thing, Weissmuller’s performance is exactly the same. Sure his dialog is now usually in complete, if short, sentences, but he delivers it in the same stiff recitation style. Carroll Young, who wrote 1/3 of the Weissmuller Tarzan films — including Tarzan’s Desert Mystery — penned at least the first six of his Jungle Jim adventures as well. (I stopped counting there, since this review is for the 6th entry.) Additionally, while the observant reader will remember that the comic was set in Asia, the movies drop him right back into Africa. 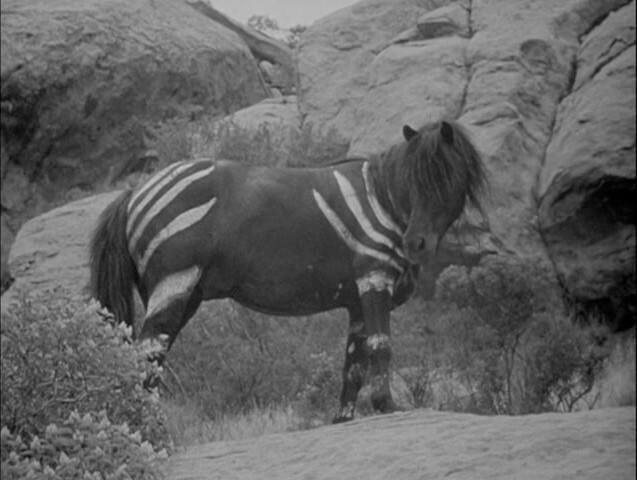 Behold the mighty ocongo, a pony with paint on it. Jim’s adventure this time out involves the rare animal, the ocongo, which turns out to be a pony with a few stripes painted on its sides. This beast is worshipped by the Ocongo tribe — made up mostly of Asians and a few whites in makeup — who more or less dress like islanders. The ogongo eat a narcotic plant and have a gland that extracts and strengthens the drug. For reasons. Enter the drug cartel that plans to harvest the animals for about a month worth of product. Jim and Cameron agree to look for the Leta’s kidnapped tribesman. The picture opens as Ronald Cameron (William Henry) crashes his plane into a lake where Jim is about to go swimming. He rescues Cameron, who cleverly hides the fact that he’s the leader of the drug ring. Instead he claims to be a territorial police inspector looking for Professor Dunham (Joel Friedkin), who was reportedly studying the ocongo when he disappeared. Dunham is in fact being forced to extract narcotics from the ocongo glands, much as the men of the Ocongo tribe are being forced to capture the animals. Cameron kills an escaped Ocongo tribesman before he can reach help. A lot of the run time is occupied by Cameron using Jim to get safely back to his camp. Along the way they are captured by Ocongo women and are only released because of Jim’s knowledge of their customs. Here they pick up Leta (Sherry Moreland), who can guide them to the ocongo feeding grounds, where the white men have taken their tribesmen. Once they arrive it’s a free-for-all between the Ocongo tribe, Cameron’s muscle, Jungle Jim, and the ocongo. Yes, the painted horses get in on the action, and it’s beautiful. The women of the Ocongo tribe wreck some of Cameron’s thugs. I promised a giant spider, and I haven’t forgotten. During the first desert crossing, while Cameron is still pretending to be a police officer, our trio is beset by a sandstorm. 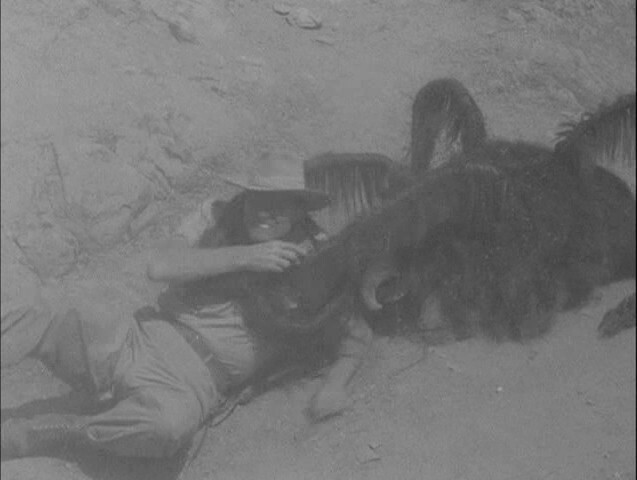 While taking cover from that, Jim is attacked by what Leta identifies simply as a “desert spider”. It’s sort of a lump the width of a manhole cover that has fernlike legs and a couple of weird fangs jutting out of the front. It doesn’t seem capable of much, but Weissmuller gamely pretends to struggle with it for a bit before stabbing at it and escaping. There’s really no point to its existence. No others appear to conveniently dispatch drug thugs, and others cross the desert without incident. It’s just a thing that adds a moment of excitement and a minute of precious padding. Jim struggles with a desert spider during one of many sandstorms. The more I think about the desert spider, the more awesome it becomes. I always appreciate a giant spider, even when it really could be removed without anyone noticing, but this is one of the few that sort of makes sense. 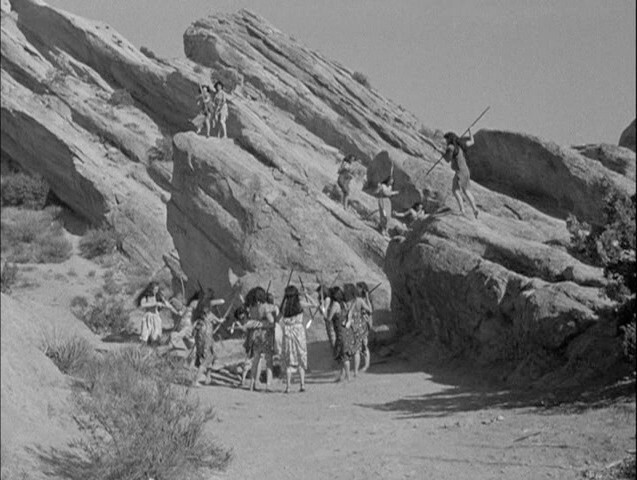 The ridiculous design starts to make sense when you see occasional bits of scrub in the shots filmed at the ubiquitous Bronson Canyon. The spider appears to be intended to look like one of these small clumps of foliage, which is a terrific concept. Plenty of animals, both hunters and prey, have evolved natural camouflage to blend into the environment. A giant desert spider has limited options for hiding, so why not resemble a plant? Heck, I’d watch an entire movie about just that. 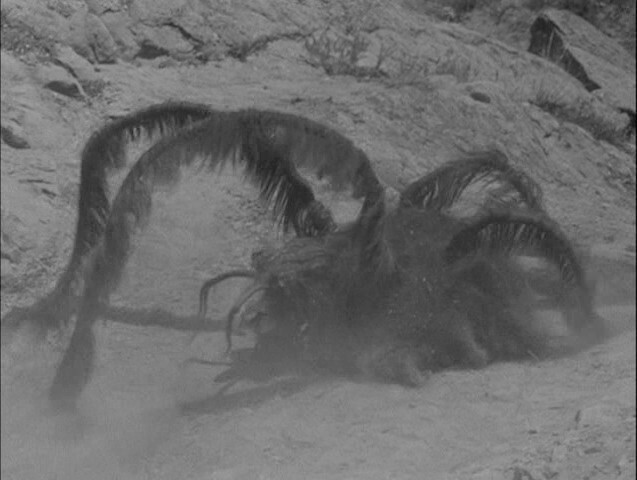 It’s hard to get a clear shot of the spider through the blowing sand, but this gives a reasonable sense of it. 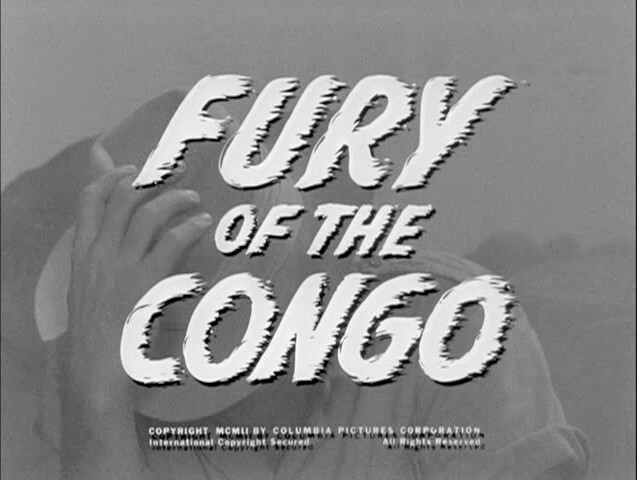 Johnny Weissmuller is an acquired taste, but Fury of the Congo is short and crazed enough that it just might serve as your entry drug. It would have fit into MST3K’s schedule smoothly: a charmingly goofy movie that maintains a good pace and serves up genuinely outrageous moments among a lot of generic foolishness. In fact, it’s a little surprising to me that none of Weissmuller’s oeuvre ever appeared on the show. Anyway, the Jungle Jim movies are readily available on DVR at low prices, so if you’re at all curious about the man who invented the Tarzan yell they’re a good way to go.